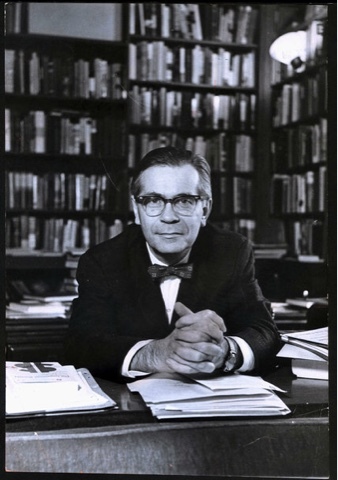 In 1969 Hofstadter published a book on American historical writing with the intriguing title, Progressive Historians. The book is a study of three important American historians from the first few decades of the twentieth century, Frederick Jackson Turner (The Frontier in American History), Charles Beard (An Economic Interpretation of the Constitution of the United States), and Vernon Parrington (Main Currents in American Thought: Volume 1 – The Colonial Mind, 1620-1800). The title itself raises interesting questions of historiography: what is a “progressive” historian? Does this phrase build an unacceptable degree of normative commitment into Hofstadter’s understanding of historical writing? The big question here is this: how should a historian think about the two axes of “what happened?” and “was it part of a good thing or a bad thing?” in constructing a program of research in a historical topic. Are the two questions inseparable, or is a dispassionate and discovery of the events and causes of the history in question, without an attempt to theorize how that narrative fits into a set of political values? So their status as “progressive” thinkers does not derive directly from their political views, or at least the political views expressed in their historical writings; but rather from the background assumptions on the basis of which they proceeded. They were historians within the idiom and mental frameworks of the Progressive era. They were oriented by the conflicts of interest that existed in the United States — in politics, in universities, in letters — and they believed that ideas and interests unavoidably intersected. And they sought to understand important elements of political culture in terms of those conflicts. So what about the other part of the phrase, “history”? Hofstadter recognizes that there are several different purposes served by historical writing. But one crucial role is the establishment of public memory as a foundation for civic identity. This is a view of history that emphasizes the committed nature of the genre — the need to tell a story that inspires identity and admiration. But what about objectivity and facticity? Hofstadter refers to “scientific” history, but he doubts that this genre succeeds in excluding a normative stance from the interpretation of a people’s history. Since individualism is so central to the American political identity that Turner addresses, these distinctions are critical. I find several aspects of the book particularly interesting. One is the remarkable level of detail and context that Hofstadter is able to provide for the positions and interpretive orientations of the three primary historians whom he discusses. This is a level of scholarship that seems remarkably deep by contemporary standards. Second, Hofstadter spends a good deal of effort towards making sense of each historian’s career in terms of his social and geographical origins. The fact that each of these men were born in the “West” — really the Midwest — is an important part of their intellectual development and the ways in which their thought unfolded. Finally, Hofstadter takes each historian seriously but critically; he gives rigorous efforts to the work of tracing out the ways in which their views go wrong, as well as the valid insights that they express. Another interesting aspect of Hofstadter’s approach is the emphasis he gives to “modernity” as a theme for these early twentieth-century historians. The book warrants close reading. This is another of the books published a half century ago that still have light to shed on our current predicaments in understanding our own unfolding history — not antiquarian but very contemporary.